Our employment discrimination lawyers in San Jose, CA regularly litigate	these claims before government agencies and the courts, bringing our special	understanding and expertise of discrimination laws to protect your dignity	and enforce your rights in the workplace. The Federal Civil Rights Act of 1991, as amended, as well as California’s	Fair Employment and Housing Act, provide that employees may not be	discriminated against based on age, race, religion, gender, marital status, disability	or sexual orientation. This applies to the hiring process, promotions,	raises, scheduling of vacations, or any other significant employment benefit. Discrimination may entail a pervasive	“	hostile work environment”, permeated with racial overtones, slurs, jokes or the like, and may also	entail the deprivation of a material job benefit or denial of a medically	necessary reasonable accommodation. Our employment attorneys in San Jose,	CA are extremely experienced with employment discrimination laws. Hostile environment claims arise where discriminatory intent surfaces through	unfair performance reviews, discipline, or wrongful terminations, (typically	by managers other than the original hiring manager). Retaliation for objecting	to unlawful practices is also protected under both federal and state civil	rights laws, as well as California’s Whistleblowers Protection law. It is often difficult to prove motives for employment discrimination. While	treating an individual in a protected class differently from their peers	does not itself prove discriminatory intent, such disparate treatment	is certainly core evidence of discriminatory practices. Age discrimination may additionally be proven through an employer’s	having established practices or policies which adversely affect older	members of the workforce, without any actual intent to discriminate against	its older workforce. One instance of this is where a company establishes	a practice of eliminating the higher paid positions. This may constitute	age discrimination where such higher paid positions are predominantly	a result of promotions, pay raises and long tenure, traits possessed by	older workers. It is important to promptly seek an employment attorney if you feel that	you may be the victim of discrimination in the workplace. Often companies	will “ramp up” discipline, also referred to as “papering”	the employee out. This often begins with pretextual performance criticisms,	which may be accompanied by outright lying. Over the course of up to 90	days, the employee may find himself on a Performance Improvement Plan,	or other corrective counseling, with either ill-defined or impossible	goals to achieve in order to remedy the situation. Don’t wait until	this occurs. If you believe that there is discrimination involved, act	promptly to seek legal advice from an employment lawyer in order to manage	the situation before you lose your job. 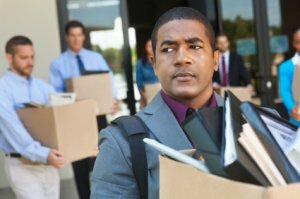 While employment discrimination	may often be hard to prove, retaliation for objecting to same frequently	presents a more available proof that the warning was pretextual or that	discipline promptly followed the objection to discrimination. Discrimination	claimants are required to timely exhaust their administrative remedies	before the U.S. Equal Employment Opportunity Commission (EEOC), (within	300 days of the last event of discrimination in California), or the California	Department of Fair Employment and Housing (DFEH), (within 1 year of the	last act of discrimination). At the Advocacy Center for Employment Law, our discrimination lawyers can	thoroughly evaluate each case on its facts and offer clear advice on the	law and potential remedies, both prior to, and if necessary, throughout	litigation or agency mediation process with our many years of successful	representation in such claims.